New Look & Loving It! You may have noticed, you may not have, but either way I thought it might be fun to announce it and give you a couple updates as far as what's going on aesthetically here on DL. 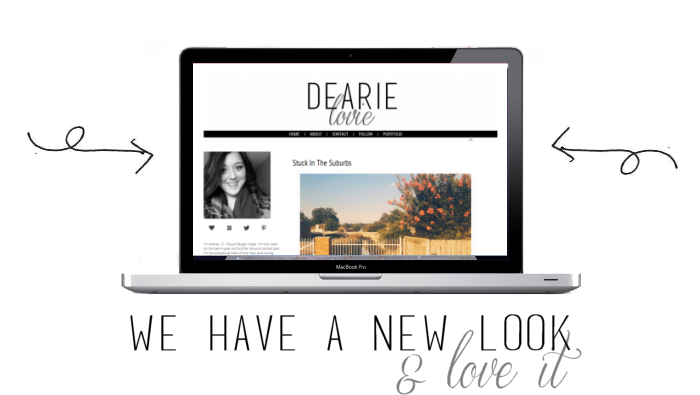 First and foremost, my blog was long overdue for a little face lift. I'd been itching to do something about it for about six months and didn't enjoy blogging as much because I wasn't comfortable in my space anymore. It was time for change. Due to finances, I decided to take on the redesign myself. I don't know if I'd call it a full redesign, but a nice modification. Once I save up, I fully plan on doing something more extensive because there are so many of you amazing blog designers and code savvy people that could probably make the dreams in my head come to life. For now, this redesign feels good and accomplishes a lot of the goals I started out with. Most importantly, I wanted to simplify the blog. My blog felt busy and unorganized. I needed to rearrange, minimize, and rethink a lot of elements on my blog so that they were easy to navigate and effective. I knew I wanted to incorporate more white space, pick a more up-to-date photo for the sidebar, make my navigation more central on the page (you can't miss it now, hooray!) and add easily accessible social media links. I happily got all of these things accomplished! I feel like I stripped away a lot of the bulk design wise and have a fresh palette to begin again with. I'll be redoing my 'About' page and 'Contact' page in the near future so that their style is more in sync with the new blog design. Another big element was redoing my logo. I decided to go with a combination of a sans-serif font and a scripted font. It felt nice and balanced and it also represents the duality I like to always note in myself and my space. Overall, it's a cleaner, more professional sort of look and I'm definitely loving the vibe of it. I look forward to continuing to blog in this space. Hope you'll stay with me! Also, what do you think of the changes? Let me know!